2018 came and went, and while no diamond managed to break the record set by the Pink Star during 2017, there were plenty jaw dropping stones that managed to “wow” audiences and set headlines in the year that passed. 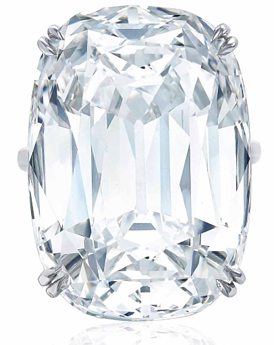 The 50.47 carat, Cushion brilliant-cut, VVS1 clarity, D color diamond managed to fetch an impressive $6.4 million on May 16, 2018, during Christie's, Geneva Sale. The type IIa, is set in a platinum ring, size 6 ¾, by Harry Winston. 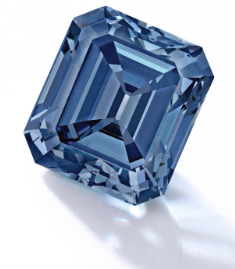 This rare 3.47 carat, rectangular, step-cut, Fancy Intense Blue diamond, managed to sell for a respectable $6.66 million during Sotheby's, April 18th New York sale. The final price tag for the stone, translates to $1.92 million per carat. 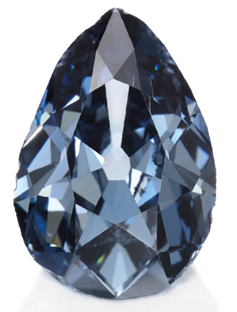 This historic 6.16 carat, pear cut, fancy dark grey-blue diamond, is set within a frame of pinched-collet set cushion-shaped diamonds, and was sold with a fitted case with a plaque mentioning the provenance of the stone. The SI1 clarity stone fetched a final price tag of $6.7 million during Sotheby’s May 15th Sale in Geneva. The unmounted stone was graded by the GIA as being a Flawless, D Color, with Excellent Polish and Symmetry. 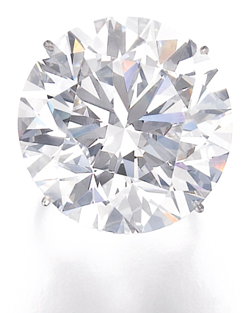 The type IIa colorless diamond was sold for $8.1 million during Sotheby’s May 15th Sale in Geneva. Similarly to the stone above, this diamond too was graded by the GIA to be of exceptional quality. The round brilliant cut, 51.71 carat, D color diamond, was given an Excellent grade for Cut, Polish, and Symmetry, all the while holding a type IIa classification. 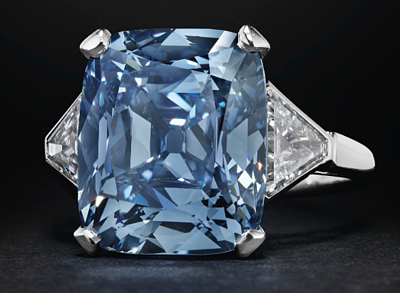 The diamond ultimately sold for an exceptional $9.2 million during Sotheby’s May 15th Sale in Geneva. 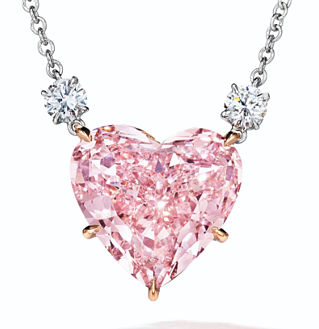 This 15.56 carat, heart modified brilliant cut, Fancy Intense Pink diamond was set in a platinum and rose gold necklace, alongside circular-cut colorless diamonds. 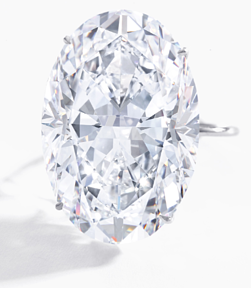 The type IIa, VS1 stone yielded $9.5 million during Christie's December 5th Sale, in New York. 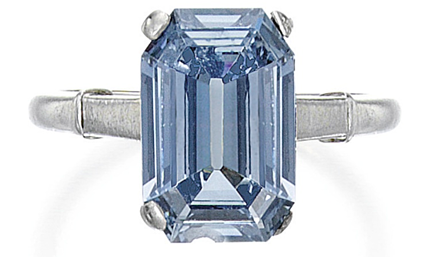 This rare 5 carat, step cut, VS2, Fancy Vivid Blue diamond was mounted in an 18 karat, white gold ring, alongside colorless, baguette diamonds. The truly remarkable diamond managed to wow audience, as it ultimately sold for $13.8 million (or $2.76 million per carat) during Sotheby’s October 3rd Hong Kong sale. This truly breathtaking 8.08 carat, cushion modified brilliant cut, VS2, Type IIb, Fancy Vivid Blue diamond was set in a platinum ring size 6 ¼ by Bulgari; decorated with triangular-cut colorless diamonds. The stone ultimately fetched a very impressive $18.3 million (or $2.26 million per carat) during Christie’s December 5th, New York sale. Perhaps one of the most beautiful pieces we’ve seen all year. This lot was comprised of a 8.01 carat, pear cut. 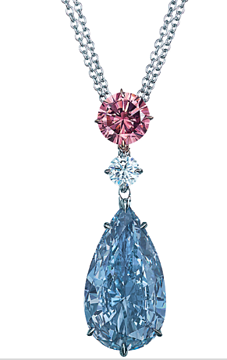 Fancy Vivid Blue diamond, surmounted by a 1.60 carat, circular cut Fancy Intense Pink Diamond, both of which were mounted on a golden double neckchain by Moussaieff. The piece was sold for $20.3 million during Christie’s May 29th Hong Kong sale. 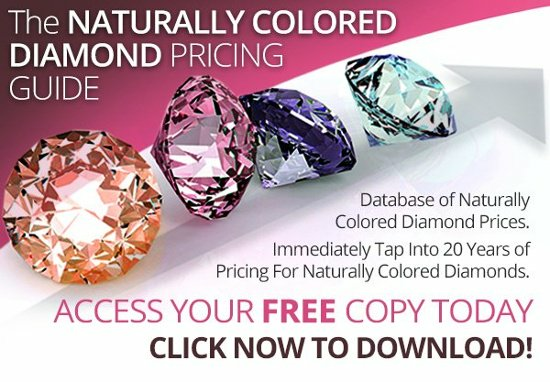 The final diamond on our list, the Pink Legacy is definitely not the least, both in terms of beauty and price. This beautiful 18.96 carat, VS1, emerald cut, Fancy Vivid Pink stone, was owned by the Oppenheimer family, until it was put for sale during Christie’s October 13th Geneva Sale. 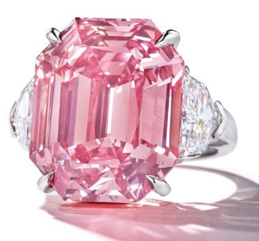 It was at that time that the diamond fetched an astounding $50 million ($2.7 million per carat), essentially shattering the price per carat record for pink diamonds, and removing the Pink Promise from its throne. Which diamond was your favorite? Do you have any honorable mentions you think we should have added to our list? Let us know! And as always, feel free to follow us on Twitter and LinkedIn. Should I Invest In Loose or Colored Diamonds?